Watching the colorful flower market in Dadar East (previously known as phool gully) unfold at 6 AM every morning is a sight. Its chaotically beautiful, and the colors can soothe your senses. If you want to know where all your tiny local flower markets get their bulk supply from, read on. If you’ve been in Mumbai long enough, you know the golden rule: avoid Dadar station as much as you can. The chaos, the people and the never ending trains, it all makes for a rather intimidating and often chaotic experience. To save us from the ordeal, we reached Dadar station at 6.30 AM, the sky still dark and eyes drooping from sleep. To our surprise, we found the station and subsequently the market to be bustling with vendors, hawkers and people. However, Phool Gully is a really tough lane to crack if you aren't used to the daily grind of the city and all the hustle and bustle. But go there for the blast of colors, the mesmerizing fragrance of flowers, and just because how inexpensive they are. 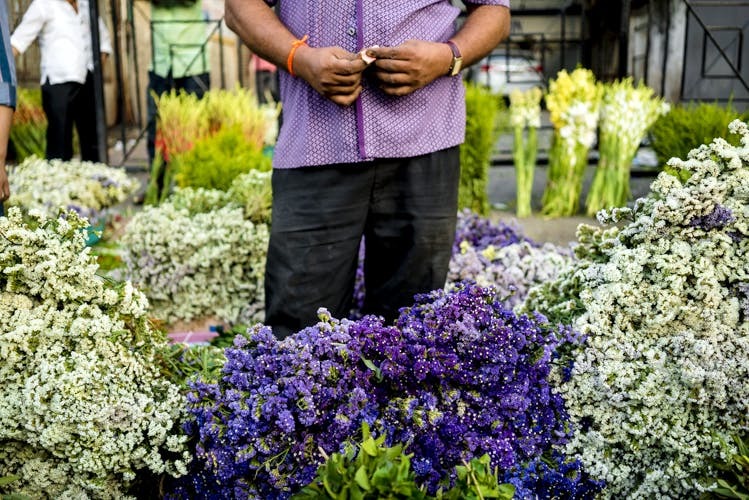 P.S- While you're on a flower-shopping spree, visit the flower market in Matunga too. The whole lane outside the Matunga East station (Telang Road) smells of filter coffee and freshly plucked flowers. The south-Indian garlands are on high demand always, and there is an old south-Indian style temple called the Bhajana Samaj Mandir which is gorgeous and deserves some space on your Instagram feed. Add this to your list as well!